Precision conveyor – it’s a descriptor that fits. After all, replacing a belt on one of these systems is not as easy as it sounds. Unlike with case-handling conveyors, there is little room for error when it comes to precision conveyor belting – it’s literally a game of millimeters. As a result, it is vitally important for end users to select quality belts that fit correctly to ensure their conveyor continues to deliver optimum performance and maximum return-on-investment. There are actually three primary considerations when it comes to determining the correct belt size for a precision conveyor – belt length, belt width, and belt tension. This paper will provide a brief overview of all three in an effort to help manufacturers avoid the surprise maintenance issues and costly production delays that have become all too common when a belt is installed incorrectly or a lesser-quality belt is utilized on a precision conveyor. On a typical case-handling conveyor, the belt is relatively far from the sides of the conveyor – as much as one-half inch or more. But, on a precision conveyor, there’s much less space. In fact, it’s typically 1/8 of an inch from the sides of the conveyor. This more accurate sizing is necessary to facilitate smooth product transfers and also helps improve the overall safety of the system for operators and maintenance personnel. If a wider than ideal belt is placed on a precision conveyor, it will ride up onto the sides of the system, which places unnecessary strain on the motor and quickly leads to a variety of premature belt-wear issues. Without question, the edges of the belt will quickly begin to fray, making the system susceptible to particle problems and allowing product to get caught under the belt. On the other hand, a proper fitting belt is sized to exact standards. For example, the belt on a 12-inch wide precision conveyor is really only 11.930 inches in width. This seemingly insignificant size difference is the key to keeping the belt running flat and very close to the sides of the conveyor without actually making contact. Of course, mastering these precise measurements can be difficult and the vast majority of belt distributors simply cannot deliver the level of accuracy required for optimal performance. The length of a belt on a precision conveyor is also a very important component of the system’s overall performance and longevity. It is essential to keep in mind that a belt must be sized correctly not only for the length of the conveyor, but also for the diameter of the rollers. 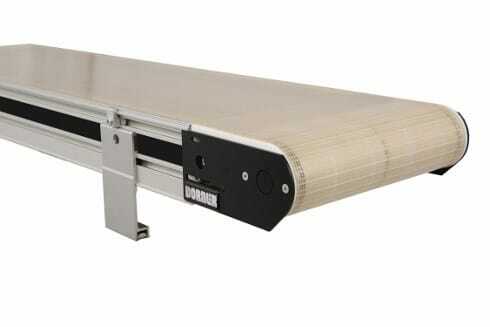 For instance, the belt on a three-foot long Dorner 2200 series conveyor is not six feet, but actually 6.109 feet in length to compensate for the rollers. While ensuring accurate belt width and length are crucial – a higher percentage of issues in today’s production facilities actually stem from an improper level of tension between the belt and roller. If too little tension is applied, the belt will slip, creating friction that quickly erodes the underside of the belt and leads to permanent damage. Then again, if too much tension is applied to the belt, it will stretch prematurely. While most precision conveyors allow the operator to move the roller back approximately one inch for additional tension, once the roller can no longer be extended, the overstretched belt must be replaced. When setting belt tension, it’s extremely common for maintenance crews to over tighten the belt to ensure it will carry the specified load. However, this is a mistake that invariably leads to early stretching and significantly shortens the lifespan of the belt. Identifying the appropriate level of belt tension is typically not easy. The proper tension differs based on the width of the conveyor. A 6-inch belt may require 50 in/lbs., while a 24-inch wide belt could require 100 in/lbs. – a significant difference. 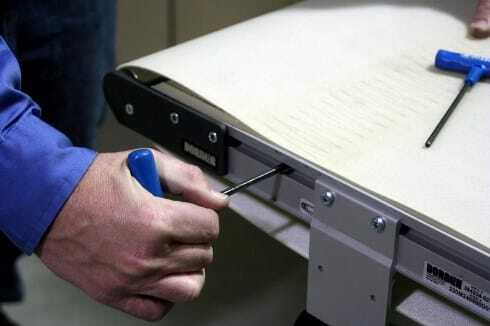 Maintenance crews should be careful to utilize a torque wrench and closely follow the recommendations of the conveyor manufacturer whenever adjusting tension. As clearly demonstrated, there are numerous benefits to paying meticulous attention to belt width, length and tension when working with a precision conveyor. Unfortunately, these benefits can quickly become moot if a poorly manufactured belt is utilized. When purchasing belts for a precision conveyor, be sure to work with a supplier that truly understands the complexity built into these surprisingly sophisticated systems. Much like they would probably avoid placing inexpensive tires on a high-performance sports car, it is important for manufacturers to not purchase a lower-quality belt for their precision conveyor. Rather, they should seek out products from reputable manufacturers that will help enhance their previous investment. Finally, make sure the belts ultimately selected have been tested in similar applications to your own and only purchase belts that have been cut with a high degree of accuracy. Because when it comes to precision conveyor belting – the slightest measurements can lead to the biggest problems.